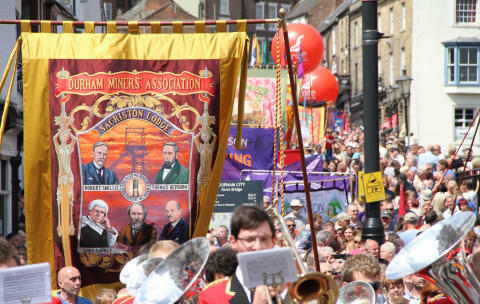 Planning on attending Durham Miners' Gala this weekend? Here's our handy travel guide. We run a wide range of frequent services to the heart of Durham City Centre, and planning your journey couldn't be easier – simply use our Journey Planner and you'll be on your way in no time at all. Know which service you're catching? Use our Fares Finder to see your single and return fares. You don't even have to worry about carrying change – you can now pay for your travel with contactless. If you're travelling with the family, you can make a saving with our Family Day Ticket – only £10 on the Go North East app, or £13 on the bus. The ticket covers up to two adults and three children under 16. Minimum of one adult and one child. We'll also be running extra journeys on our 265 service between Murton and Durham. There will be duplicate journeys from Murton at 9.20am, 10.20am, 11.20am and 12.20pm to give extra capacity, and the same for return journeys from Durham at 5.18pm and 6.21pm. Bus stops on Milburngate, North Road, Claypath, Elvet and New Elvet will all be suspended between 6am and 8pm. Please use Durham Bus Station or County Hall stops for 13, 14, 15/15A, 16/16A, 21/X21, X22 or 50, and Durham Bus Station and Leazes Bowl for 20/20A, 204, 208 and 265. Services 13 and 14 will use Stand A in Durham Bus Station. Services 13, 14, 15/15A, 16/16A, 21/X21, X22, 50/50A will run to Durham via Framwellgate Peth and Castle Chare. 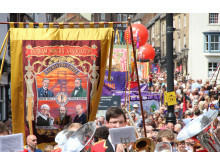 From Durham they will depart the bus station via the entry point and run via Castle Chare and Framwellgate Peth. Between 10am and 3pm, services will be able to use the top half of North Road, serving stops near Wharton Park. Service X21 will run the daytime route until 8pm in both directions. Services 204, 208 & 265 will not serve Claypath in either direction, diverting via the 20/20A route on Leazes Road and Leazes Bowl. From Durham these services will depart from the bus station via the entry point and via Castle Chare.